Fans of driving games traditionally either had to put up with filmsy wheels that made racing less convenient than using the standard analog stick controllers. 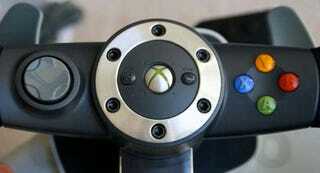 With the Xbox 360 Wireless Racing Wheel from Microsoft, lousy first party racing accessories are a thing of the past. In all honesty, this was the best racing experience we've ever had. Build quality was excellent, since the wheel was incredibly solid and grippy and the paddles were placed just right for easy shifting. Although you can't spin the wheel 720 degrees like in a real car, it did give you tight control of whatever car you were driving. The pedals were also extremely lifelike, since your ankles hold them in place, and both the gas and brake had enough push-back to keep you on your toes, so to speak. But the big question is how these behaved with games? The answer: fantastic. The wheel ships with a modified version of Project Gotham Racing 3, which also comes with the drivers necessary to make the wheel work on other games. The best example of how well this wheel works would be the F50 GT that everyone loves to use—because it's the fastest—but is incredibly hard to control. Using the wireless racing wheel, driving the beast felt like cruising down the I-5 in a Honda Civic. No problems at all! The other game we tried was Need for Speed: Carbon. The older NFS game doesn't have wheel support, but Carbon does in spades. Our experience with Carbon can be summed up like this. After a day of playing with the standard 360 controller, we were set to return the game since it wasn't that much better than the other Need for Speed. After we got the wheel, however, everything just felt right. Our mouths were agape, and our tongues were wagging in a Jordanesque fashion trying to nail those tight corners. Long story short, this is the best thing to happen to Xbox 360 racing games. Ever. If you're a racing fan—or just want to become a racing fan—get this controller. Seriously.